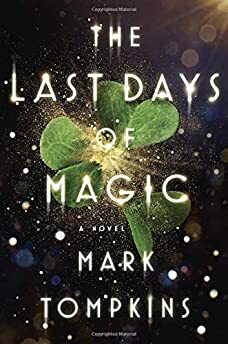 Largehearted Boy: Book Notes - Mark L. Tompkins "The Last Days of Magic"
Book Notes - Mark L. Tompkins "The Last Days of Magic"
Mark L. Tompkins' The Last Days of Magic is a sweeping debut novel that melds history with mythology and folklore. "Plundering the treasure chest of human myths, from mysterious biblical giants to ferocious Celtic faeries, Tompkins has created a fantasy adventure with the shifting perspectives of dreamscape. A novel rich and strange." Music is more than memory, though it is certainly that to me as well. Music, in its cadence and meter, allows memory to dance and flow into undiscovered areas of my consciousness, which is how stories form. Perhaps it is because I write tales based on history and mythology that there is such a component of memory – mine and the collective. And, as I get deeper into the narrative, imagined memory. Almost all my writing playlists are instrumental or have non-English words. I want music to carry me to a new story, not tell me one. I need it to inspire the voice in my soul to sing its own song, a song in ink. Writing is a physical (I still use a pen) and emotional process and music integrates the two. Music carries me to foreign places and other times, allows me to inhabit them while I write. The choice of music is part of my daily ritual, sometimes I choose one album, other times I setup a mix. It depends on what I am working on, what I need to remember and feel. The following are the albums that helped me write The Last Days of Magic. When I wanted to be transported back to the Hill of Tara to gaze out over the countryside, or smell the salt air of Galway, or re-experience any of the Emerald Isle, I played Lúnasa's Otherworld album. It's as Celtic as it gets. Zucchero's Chocabeck album (Italian version) was playing in the background whenever I was writing about Venice or Rome. I discovered Zucchero during my first Italian road trip and Chocabeck never failed to carry me back there. The often haunting melodies from the Game of Thrones soundtrack reminded me of the magic which underlies everything in my story, and the risks of forgetting its latent power. When you read a chapter that has a lot of enchantments in it, I was probably listening to this while I wrote it. The scenes in England and France were thick with scheming Kings, Queens, and Popes so I found this music was aptly inspirational for them as well. Battle sequences called for big, straightforward music. The Last of the Mohicans soundtrack, with its frequent ominous undertones, was perfect when a lot of people were killing a lot of other people. Editing sometimes required me to take a fresh approach to a passage, or a chapter. My go-to album during that process was Moodafaruka's La Luna Lounge, a mashup of gypsy, Middle Eastern, and Spanish melodies that was completely different than any of my other writing music. Sometimes I just needed to remember my deep love of fantasy literature so that I could keep going in the creation of my own. Foundational to this love was the Chronicles of Narnia. The soundtrack of The Lion, the Witch, and the Wardrobe refreshed and reenergized my writing. The soundtrack of The Lord of the Rings reminded me of the epic nature of the book and helped me avoid becoming stalled on any one aspect of the story line. There is a good chance that half the book was written while listening to Howard Shore's magnificent score, either by itself or mixed in. And sometimes I needed to remember to have fun with the writing. I am a firm believer in the saying that fun to write is fun to read. For this, I would put on the soundtrack of the original Pirates of the Caribbean. In fact, I listened to it while writing this post.